Start: Beginning in a pushup position, keep your abs tight and your glutes squeezed. To make it easier, have the ball more toward the knees, and more difficult, have the ball on your toes with your feet flexed. Finish: Contract your abdominals and lift your hips in the air, bringing your knees in toward your chest. Keep shoulders tightened so you don’t fall forward!!! Slowly return to the pushup position. Be careful not to let your stomach or shoulders sag, but rather push out through your chest, and keep your abs contracted the entire time! Start: With your elbows on the ball and your fingers clasped, push out through your chest and squeeze your abs and glutes. 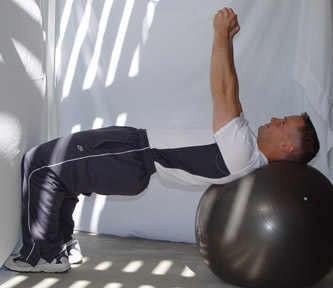 Since this is an isometric abdominal exercise, I recommend holding the tight position for 20 or more seconds. Be sure to breathe, and keep squeezing all over!!! When this gets easy, you can put your feet on a step or block and eventually have some one add some weight to your back. Start: This is a more advanced version of the ball tuck. It is very similar, but with your legs straight. Beginning in a pushup position, keep your abs tight and your glutes squeezed. To make it easier, have the ball more toward the knees, and more difficult, have the ball on your toes with your feet flexed. 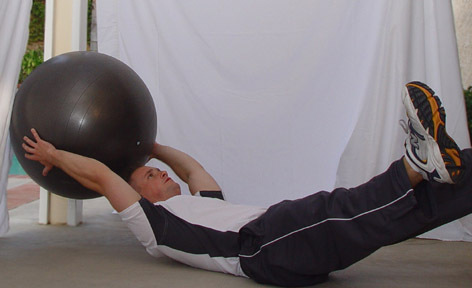 Finish: Contract your abdominals and lift your hips in the air. Keep shoulders tightened so you don’t fall forward!!! 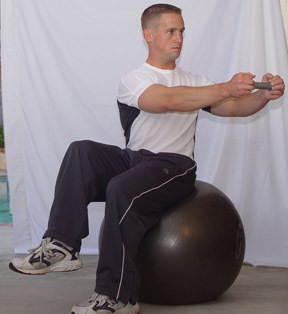 Start: In a seated position, hold a weight in front of your body and tighten your abs. Be sure to sit up straight and tall before turning. 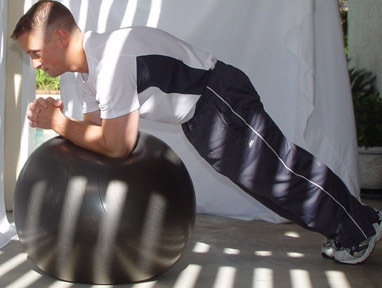 Finish: Keeping your abdominals tightened, slowly rotate to the side. 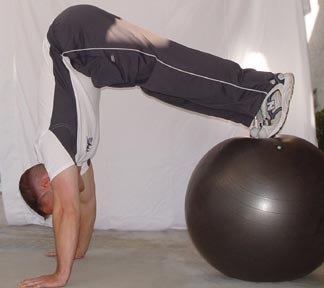 Start: In a ball bridge position, hold a weight in front of your body. 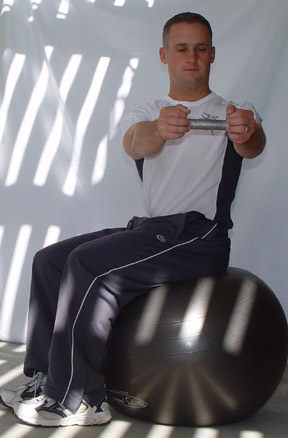 Finish: Keeping your abdominals tightened, slowly rotate on to your shoulder. The ball should turn a little bit. 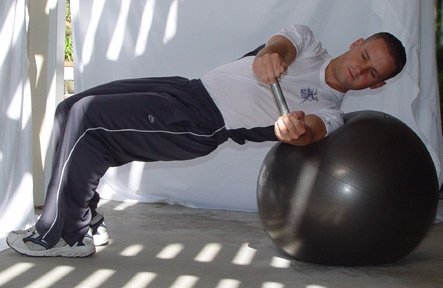 Make sure your abs stay tight the entire time as you slowly rotate back to neutral. 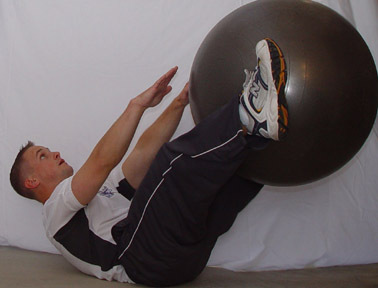 Start: Lay flat on the ball, keeping your abdominals tight and head straight as with the Abdominal Curl. Turn slightly on to one side of your low back/ hips. Keep your feet wide for balance. Finish: Tighten your abs and lift your shoulders up, bringing your left elbow toward your left knee. Start: Kneeling on the ground and your hands on the ball, contract your abs, keep your lats tight, and squeeze your bottom. 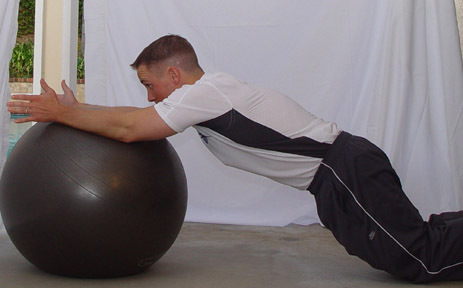 Finish: Slowly roll the ball forward, making sure you keep your abs tight, and bottom tight, without bending at the hips. 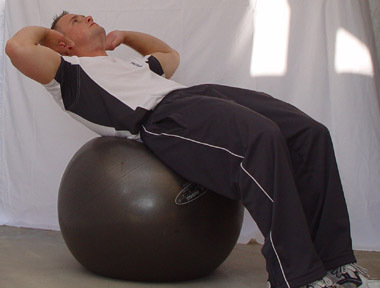 Start: Lay flat on the ball, keeping your abdominals tight and head straight (try your best to not yank on your head). 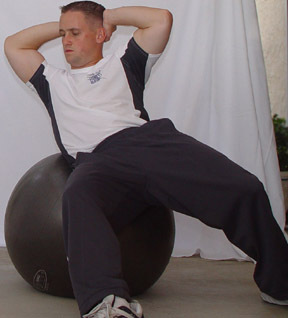 Do your best to not arch over the ball in a relaxed state. You want to be flat, but not arched. Finish: Tighten your abs and lift your shoulders up, bringing your left elbow across the belly button, and in the direction of your right knee. Finish: Tighten your abs and lift your shoulders up, keeping the head straight (It helps to look at the sky). Start: With the ball between your feetand low back pushed against the floor, reaching toward the ball with your head up. 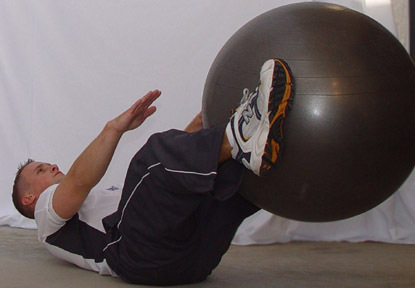 Finish: Keeping your abdominals tightened, grab the ball from your feet and slowly bring it over your head while slightly lowering your feet. 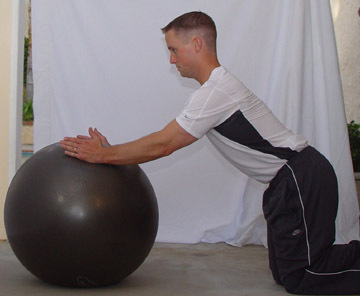 It is very important to keep your low back pushed against the ground on this exercise. If it begins to come up, keep your feet high in the air. Return the ball to your feet and repeat. Start: Lying on the ground, keep your low back pushed against the floor. With the ball between your feet and your head straight (try not to yank it forward), reach your arms forward. 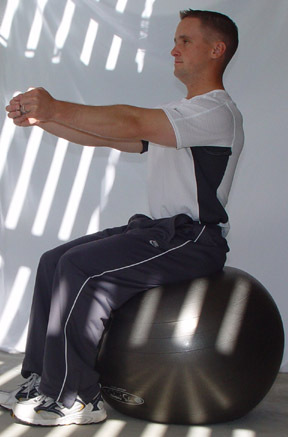 Finish: With your abs tightened and head still straight, lift your shoulders off the ground, and reach toward the top of the ball. Start: Similar to Core Rotation, keeping you abdominals contracted the entire time, lift one foot, and rotate slowly to the side. 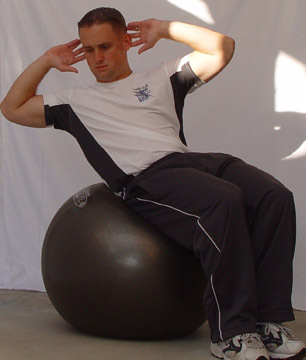 Repeat to other side, keeping abdominals tightened.